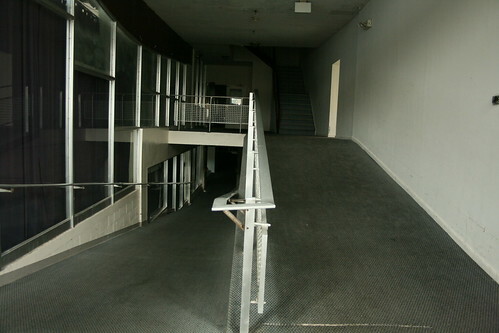 Sunlight spills in from behind the indoor pool in this photo of the inclined passageway from the main building to the sports center. Originally there were stairs here, leading to the unusual doorway seen earlier. Also, on the rows of windows to the left, you can see one window with an unusual flashing against the floor, the result of the incline being added to the existing passageway.